PVC or Rubber (or urethane)? There have been countless postings regarding this subject on various rafting forums over the years. We get the same questions landing in our in-box too, so it's way past time to give a detailed explanation. Sorry for the length of what follows but there is much to cover, and even this long dissertation is not going to be complete. 1a) PVC rafts assembled with glue, generally imported from China, the Balkans, So. Korea, or South Africa, or places whose names we cannot spell. 1c) Conventional welded pvc rafts, kayaks, and cat tubes. These are made in many countries including France, China, the U.S., New Zealand, Australia, Korea, and Bali. Properly welded seams on pvc boats are stronger than cold-glued rubber boat seams, and far more durable than glued seams on pvc models. This category of inflatable also has the lowest number of labor hours and the lowest material cost, which means the price will be better than a hand glued rubber boat. 1d) Coated welded pvc boats, which as far as we know at the moment would only be Maravia (U.S.). This about covers the variations of pvc boats. 2) Elvaloy, a product that can be mixed with many flexible compounds and fabric coatings (even roofing tar! ), and which has distinct advantages where glue is used. Elvaloy in it's basic state is a resin compound from Dupont. Among other products, it is used for Seaman's Mariner-X boat fabric. Seamen's Corp is an American fabric coater who make the material for a number of inflatables, including our Trinity II-USA kayak. Unlike PVC, should one need to use glue with Elvaloy based boat fabric, no outgassing of the plastic's softeners will occur. Use of the Elvaloy resin somehow encapsulates these softeners. It is the outgassing that breaks down the adhesive on glued pvc rafts over time. The problem with Elvaloy boat fabric is that it costs a lot more than standard pvc coating, so raft makers have not beat down Seaman's doorstep for it. Some of the higher end marine boat builders do use it though, because it is nearly impossible to weld on a motor transom or a rigid bottom. With regular pvc boats where the transom is glued, this is invariably one of the first two failure areas. The Mariner-X material also has UV resistance that rivals hypalon/CP. 3) Polyurethane (a.k.a. PU, a.k.a. "lexatron") is the last of the non-rubber coatings, though in one sense it is a fancy synthetic rubber. It's sometimes refered to as just "urethane" when discussing boat material, and is a compound that really does take a chemist to understand. If you have the aspirin handy, go ahead and wiki it and you'll see what we mean. In the most basic terms, true urethane starts as a white powder not unlike the Elvaloy resin mentioned above. By mixing it with various elastomers it can by made into anything from foam to skate wheels to boat coatings. As it stands for now, the main whitewater products actually built with PU coated fabric would be the Sotar rafts, some Incept boats, and in the recent past, Bill Wing's boats - though Wing still uses it for marine products. Maravia rafts also have an exterior coating of sprayed PU, though they start as basic welded pvc boats mentioned in section 1d above. Raft grade PU material is produced in Israel, Korea, the U.S., France, and recently in China. 4a) Chlorosulfonated polyethylene, or what used to be known by DuPont's trademark name as Hypalon. Dupont quit making their hypalon pellets around the Summer of 2010 so boat & fabric makers are not supposed to use this name anymore. "C.P." is what is most often found on at least the exterior surface of modern whitewater rafts if they are "rubber". These include brands like Avon, Hyside, Apex, DRE, Achilles, Grabner, Gumotex rafts, and a few other European brands not imported to the States. Archer, a rubber company in Massachusetts, seems to still be using the name "hypalon", perhaps with permission from Dupont since they have been a long-time customer. 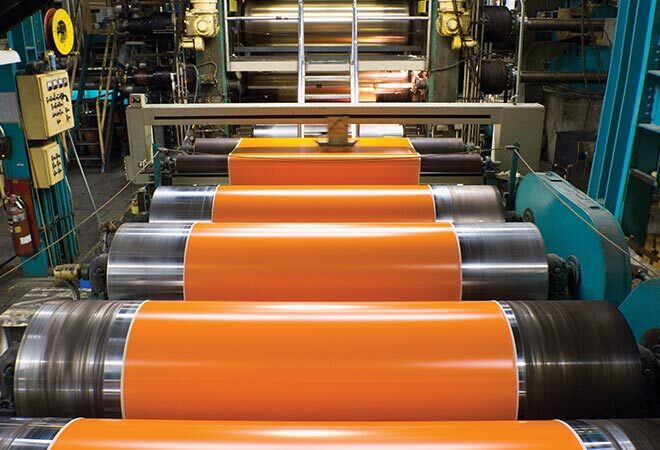 Most rubber coatings are applied to the base fabric under high pressure with specialized machinery. This is known as “calendering”, a process that provides a secure bond between the rubber and the nylon or polyester base cloth. 4b) Neoprene. Many rafters have the false impression that quality neoprene coated fabrics are inferior to hypalon/CP. While there have been some rather shoddy Taiwanese neoprene coated fabrics in past years, and some so-so Japanese material, true American made mil-spec neoprene is anything but inferior - though per measure it is heavier than Hypalon/CP. This misconception has been widely spread by various importers and dealers of hypalon boats. We have personally owned 40+ year old neoprene snout tubes with no degradation to the rubber, so the assertion of a more limited lifespan or inferior abrasion resistance is patently false. Nonetheless, there are few boats made with U.S neoprene other than Demaree Inflatables and the Shredder pontoon paddle boats. Neoprene is sometimes coated with hypalon/CP paint. 4c) EPDM. As with neoprene, there are huge differences between products like the old Formosan Rubber Group (Taiwan) EPDM and U.S.-made EPDM. Not really used for boats now, though many short-lived FRG boats coming out of Taiwan were coated with it in the 1980's. 4d) Butyl. A good air holding rubber that usually works best for interior surfaces, often mixed with other rubber compounds. Very good stretchability & air retention, so-so UV & abrasion resistance. 4e) Nitrile/Nitrylon. Gumotex's main boat fabric, out of the Czech Republic, is made with a blend of nitrile and some other secret ingredients. They do sell the material to a couple other companies. Very good, not quite as long lasting as CP/hypalon though. Archer Rubber in Mass. also makes some material coated with nitrile, but not for boats as far as we know. 4f) Latex. Super high stretchability. Super low infrared & UV resistance. Drysuit gaskets, sure. An exterior coating for boats? Not that we are aware of, and certainly not on any modern boats. Some boat sealants meant for internal use are based on dissolved latex. This is not a complete listing of rubber compounds by any means, but as pertains to the rafting industry this covers most of them. 5) There are also obscure boat-worthy coatings, such as teflon, or air-holding silicon or polyethylene coated fabrics. Teflon coated material works great for something like the top deck on an inflatable kayak. Silicon coated material has excellent abrasion resistance. And polyethylene coated polyester would make an unbeatably light, tough, inexpensive whitewater raft. There's just one thing wrong with all three of these materials: almost nothing sticks to them. So if you build an inflatable boat's main hull with one of these, and manage to get a tear, you're hosed. The few chemicals and techniques that can work require torches, or adhesive compounds that do not dry to a flexible state as raft glues must. Or, they are so bloody toxic that they require respirators and degrees of caution you could never take along side a river. To reiterate, almost every product mentioned above can be used to build high quality inflatables, or at least some portion thereof. What people who post questions to forums like MountainBuzz seem most interested in knowing though, is "what are the drawbacks, if any, to the various materials"? Before we get into those answers, we want to make it clear that base fabrics are important too. Don't just focus on what's outside. You can coat a pig with fancy polyurethane, but it's still a pig. And you can apply hypalon/CP to thin nylon and still have a weak boat. The coatings provide only a small part of the tear resistance. Some old military surplus rafts even used canvas (cotton) as a base fabric. Do you know what happens when the outer coating loses it's elasticity on this type of inflatable? It starts cracking, letting water in. Imagine what happens to soggy canvas after a season or two. Strong, stiff polyester or nylon base fabric is a must. Kevlar has even been used sporadically over the years. What potential concerns might boat owners have? With pvc rafts, there can be a couple drawbacks. As mentioned in 1a above, any glued pvc boat will eventually fail due to the softening chemicals (phthalates) degrading the glue over time. Even on welded models, if no bladders are used and the pvc itself is one of the stiffer brands, continuously rolling your boat tightly creates creasing in the coating over time, both inside and out. This can lead to porosity in those areas of your boat. Maybe you don't have to toss it in the dumpster, but you will be topping it off more often. If you trailer your cataraft or raft then creasing should be far less of a concern. Having an exterior coating pvc like Maravia does help some, as will having an inflatable made of a brand of pvc that retains it's softness longer. Again, we are not chemists but it seems certain pvc's either retain their phthalates longer, or perhaps they just use more of them. France seems to make some of the best boat fabrics, and not just pvc either. Many French, and a few Korean pvc's, tend to stay supple for a very long time. AIRE's competitors have referred to their bladders as "gimmicks", but overall those urethane bladders ensure long term air retention. And the very rollable pvc they use not only makes the boats easier to compact than polyurethane rafts, but also easier than almost any other pvc boat. AIRE's can roll up smaller than some of the stiffer hypalon/CP brands. So "gimick" or not, the combination of bladders and quality pvc does work. PVC will slip over river rocks more easily than rubber, though not as easily as polyurethane. PVC has less abrasion resistance than hypalon/CP on dry land, but our impression over decades of boat rentals is that PVC does at least as well, if not better, when it's wet. Polyurethane has very high abrasion resistance, but only moderate friction resistance. It is the most difficult material to glue anything to. True, Sotar owners rarely need patches, but what if you want to add foot cones or D-rings? Work done on PU with conventional urethane glues tends to have a high failure rate. One other potential problem is delamination of polyurethane coatings from their nylon or polyester base fabrics. Although less commonly reported today, rolling a urethane raft tightly (if you even can - more to that in a moment) can cause blistering as the boat ages. Will you be needing to roll your raft up - and if so, how small does it have to get? All PU boats, and all pvc rafts with double layers of fabric on the undersides, are a real battle to roll, as are Maravias. PVC boat brands where this applies on some or all models include Star, Vanguard, Saturn, GeneOne, Aqualine, Aquamarine, Baltik, and the Rocky Mountain boats that we sell here. As stated a couple paragraphs above it does not apply to AIRE, and most of Jack's Plastic Welding boats are fairly easy to fold as well. If your boat, pfd's, paddles/oars, pumps, cooler, frame bits, duffles, etc, need to fit in the back of your Subaru wagon, you better think long and hard before buying something that requires a troop of boy scouts to fold into a refrigerator-sized bundle. So far, maybe you're thinking, mmmm.. I better stick with hypalon/CP or a Demaree. Well, not so fast. Being expensive, hypalon/CP or American neoprene fabric will run up the cost of rubber boats. So does the increased labor required to meticulously hand glue every seam & joint, which means there are no bargain rubber boats. Second, all those floor I-beams on a rubber boat are hand glued. While some brands like NRS tend to do much better in regard to I-beam failures, others like Achilles (which are otherwise extremely durable) pop floor I-beams like Orville Reddenbachers. And most "hypee's" are inferior even to their much less expensive import pvc cousins in the handling department. Often rubber boats are considerably less rigid, even if some companies like to fool you by jacking their boats to insane pressures at trade shows. Pressures you would never get away with in the hot sun. A boat's price will give you no indication whatsoever of how well it handles on the river. You are mainly buying lifespan and handling with a raft or cat tube nowadays. Toughness doesn't enter into the equation too much for the simple reason that it's pretty hard to tear even a no-name Ebay raft. A few models like the basic NRS Otters, smaller Avon tenders, non-wrap floor Achilles, and the rare non-wrapped pvc boat might require an occasional patch, but almost none of the others will. In summary, you need to ask yourself just four questions when shopping for rafts, cat tubes, and inflatable kayaks: what is my budget; how important will handling be to me (i.e. how tough are the worst rivers I will be doing? ); how small do I need it to roll up, if at all; and how many years do I expect to keep the boat? If you won't run much more than moderate class IV rivers, almost any brand will handle well enough, though you may still appreciate the responsiveness of a stiffer raft with a better hull design. Boats with smoothly curved undersides usually do better than those with abrupt angles & upturns. If you will be boating many advanced & expert level runs, then go for something sporty. Sotars, AIRE's (particularly the "D" series), Incepts, and Maravia's tend to be among the best, with other better grade pvc brands coming in a close second. Of what is imported to the U.S. in hypalon/CP material, some models from Hyside and NRS are a lot better than that old used Riken you found on craigslist. Achilles and Demaree are not noted for being the Lamborghini's of the river. Rapids do not bow in terror at their presence. And while this is strictly our opinion, despite their steep price, we have always found the low-riding self bailing Avons to be at or near the bottom of the handling scale. If budget is everything, then models from Tributary and Rocky Mountain offer a great value. If you won't be keeping the boat indefinitely, many of the glued rafts and kayaks provide good deals if you (or the next owner) don't mind dumping a lot of pvc into a landfill - since that will eventually come to pass. AIRE's USA made rafts, catarafts, and inflatable kayaks use special high quality PVC Precontraint made by Serge Ferrari (all boats brandishing the AIRE logo). AIRE's USA made rafts, catarafts, and inflatable kayaks use special high quality PVC Precontraint made by Serge Ferrari (all boats with AIRE logo). Text Written by Lee Arbach, The Boat People Inflatable Kayak & Raft Specialists - Copyright © 2011. Please do NOT use this in any form or display in any form.